The Gamecocks took the field Friday night to officially kick off the 2014 football season. Here's a few things we learned watching the team practice. Sadly, there was no EA Sports college football title this July to transition us into football season. One of my favorite parts of this time was getting to see how they assigned attributes to my team and then complaining to anyone who would listen about how wrong they were. Welp, we might not get a new game, but get ready for some ratings to complain about! For our first position reveal, let's start with the QBs. Dylan Dog brings plenty of attractive attributes for a QB1, most notably clutch awareness (88), and that patented cannon of an arm (THP 91). Don't forget his underrated running ability either, 3rd-and-19. Connor Mitch is the young gunslinger whose high ceiling gives him the inside track at QB2. The kid might be green (60 AWR), but his natural arm makes you excited to sub him in when you're beating Clemson 77-0 on Varsity. Good ole Nossy gives you the option to run a more tradtional "Connor Shaw Offense" as the only QB on the roster with above average speed (85), agility (84), and acceleration (85). Gotta work on that arm though (78 THA). Spurrier's favorite spring practice QB. You can't ask for much more from a walk-on, and maybe he can get some mop-up duty in year two of your dynasty. On second though, nah, you'll pick up some blue-chipper from a state USC never recruits. Gibson's reaction really just says it all. It was before this game that Roland caught a seemingly-normal warmup pass, but one that would be photoshopped into a bowl of cereal, spawning Gamecock Cereal. Jadeveon Clowney entered the game coming off the infamous #gassed scandal, brought to you by ESPN. He finished with three tackles and a sack. Georgia got off to a hot start, building a 17-3 first-quarter lead behind the tree-trunk legs of tailback Todd Gurley. Gurley rushed for 132 yards and a touchdown on the day. ... and fast. He rushed for a touchdown and 149 yards, 75 of which game on this run. Kane Whitehurst almost snagged this huge touchdown pass. Murray had arguably the best game of his career, passing for 309 yards and four touchdowns with no turnovers - when he wasn't too busy handing off to Gurley and Marshall. He rushed for a seven-yard score in the second quarter, and the Gamecocks would go on to score two more touchdowns before halftime. Jones caught a pair of touchdown passes in the second quarter to make it a game again. He'd finished with 97 yards and two scores. The linebackers had a pretty poor game as Georgia piled up 41 points and 536 total yards, but Marcquis Roberts did sack Murray that one time. Shaw fumbled on a first-down rush. Here it is again. Georgia recovered and kicked a quick field goal, and the Gamecocks never tied or led again. Connor Shaw threw to Roland three times in four plays in one fourth quarter drive, hooking up with the sophomore wideout for 48 yards. The drive would end when the Gamecocks were stuffed on fourth-and-goal. ... much to the chagrin of these guys. We continue our look at the 2013 season through photos with South Carolina's second game of the season, a 41-30 loss at Georgia. Yesterday, we took a look at the best Gamecocks to wear single-digit jerseys during Steve Spurrier's time in Columbia. Today, we continue our series by remembering those who have done the most while wearing the numbers 10-19. Great players are forever linked with the numbers they wore. Plenty of talented Gamecocks have taken the field in Steve Spurrier’s first nine seasons in Columbia, but which players wore their number the best? We are taking a look at the most talented Gamecocks of the Spurrier Era by jersey number. The Gamecocks come out to '2001' for the first time in the 2013 season on a hot August night. Senior quarterback Connor Shaw tossed this beauty on the third play from scrimmage, a 65-yard touchdown to sophomore wideout Shaq Roland to take an early lead. Roland finished with two catches for 75 yards. 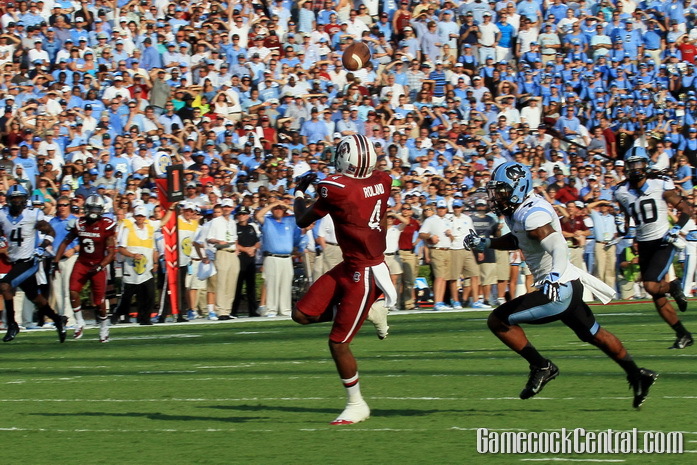 Shaw rushed 12 times for 43 yards, and passed for 149 more and a touchdown to help the Gamecocks to their first win. Wideout Kane Whitehurst caught his first career touchdown at South Carolina, a 29-yarder from Dylan Thompson that put the Gamecocks ahead 17-0 in the first quarter. Junior defensive end Jadeveon Clowney's performance sparked a seemingly endless debate on his character, willpower, conditioning, etc. Sophomore tailback Mike Davis broke off this 75-yard touchdown run on South Carolina's first offensive play of the first quarter, giving the Gamecocks a healthy 27-10 lead. Then, lightning struck. And most folks just went home. The Gamecocks held on in the fourth, and there's your final line. South Carolina opened the season with a 27-10 victory over North Carolina in Williams-Brice Stadium. Here's a look back at the Gamecocks' victory, courtesy of Gamecock Central's talented photographers.